It’s been difficult to escape the sunshine this Summer so far, with Mediterranean-esque sun (and heat) bathing the UK in June and July. However, though it’s so easy to lay back and relax in the glorious sunshine, it’s worth understanding the impact that sun damage can have on your skin so that you can evaluate how much sun is safe and right for you. Vitamin D from the sun’s rays can help the body to absorb calcium and phosphate from our diets – minerals that are essential in building healthy bones, teeth and muscles. 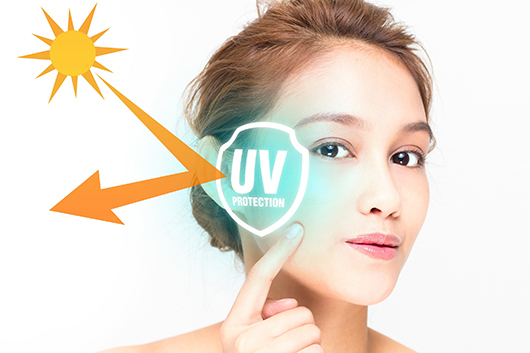 However, excessive exposure to UVA and UVB rays from the sun can damage the skin, and not just in the form of sunburn from prolonged sun exposure. Exposure to the sun’s UV rays can contribute to a degradation in skin’s elasticity and breakdown collagen structures in the skin – both of which contribute to premature skin ageing in terms of the appearance of fine lines, wrinkles and ‘sagging skin’. Hyperpigmentation is also a risk of overexposure to UV rays, as is an increased risk of Skin Cancer (with, for example, 15906 cases of Melanoma Skin Cancer in the UK in 2015, 86% of which were classed as ‘preventable’). Wear long sleeved, lightweight and breathable clothing to help cover your delicate skin. Wear a good quality, broad spectrum SPF and regularly reapply – particularly if you are swimming or exercising. You need a shot glass full of lotion for each full body application of SPF, so don’t hold back with the application! Wear a wide brimmed hat and sunglasses to protect your scalp and delicate eyes. Stay hydrated! It’s easy to get dehydrated in the hot weather, which can have a negative impact on your overall health – not just your skin! Though it’s easier to remember the SPF in the summer, or when the weather is tropical, it’s important to build it into your daily skincare regime as UV damage can occur all year round, even if you are inside or under glass! So take care of your delicate skin this summer – and all year round – it really can help to reduce your risk of developing skin cancer and delay some of the visible symptoms of ageing. This Summer has been hot, hot, hot!